Men's Eyebrow Shaving Stencil: Because Men Need to Shape Their (Uni)Brows, Too | OhGizmo! By Hazel Chua on 10/24/12 • Leave a comment! Media usually portrays men as slobs and women as vain and fussy, when the fact of the matter is that guys care about their looks, too. So why shouldn’t they have tools and accessories that will make personal hygiene and grooming easier? 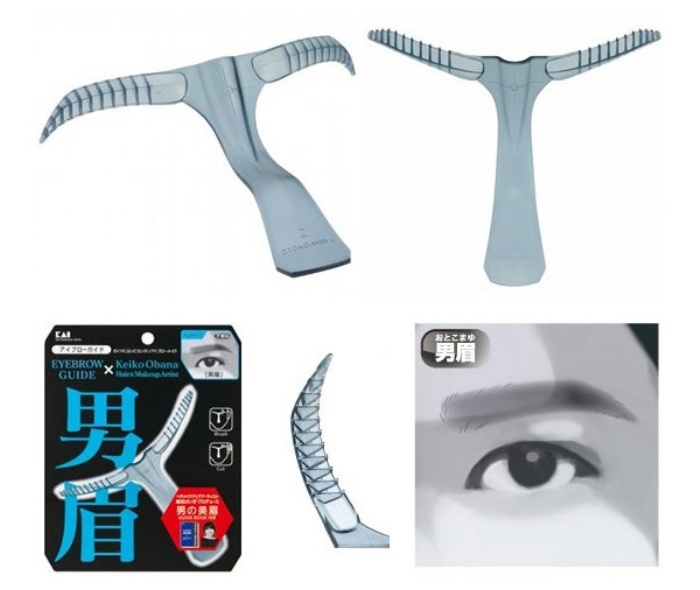 Tools like this eyebrow shaving stencil that I’m sure some girls will find useful as well. The stencil is fashioned from polypropylene, which the manufacturer claims is an ‘anti-bacterial’ material. Which is good, because we don’t want bacteria spreading on your man brows. Blech. Notably, this stencil won’t help people tame their unibrows since both stenciled eyebrows are connected in the middle by the handle. The Men’s Eyebrow Shaving Guide retails for $32.